I love this time of year because of all of the different types of wonderful squash. This is one of my favorites! Cook spaghetti squash in a preheated oven at 350 degrees. 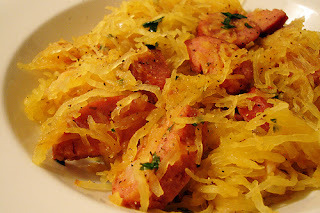 Spaghetti squash should be cooked, cut in half, cut side down (scoop out seeds) in a baking dish with a small amount of water in the bottom for 1 hour. While squash is cooking saute, garlic, tomato and basil in olive oil. Slice sausage and saute with tomato mixture (I used sweet basil chicken sausage). Once squash is done, remove from oven, and with a fork scrape squash so that it shreds spaghetti like. Pour mixture over squash and serve with bread and salad. Enjoy! This sounds yummy! I am going to have to try this recipe.